I love editing. It is, by far, my most favorite part of writing. I love editing my own work, other people’s work, bad copy on my dentist’s website … Give me a rough draft with poor sentence structure and I’ll entertain myself for hours. Becoming a serious editor, one who can pinpoint deep weaknesses in a piece of writing, is hard. Especially when that piece of writing is yours. It’s much easier to review your work for grammar mistakes, change a few words to improve flow, and call it “edited.” We grow attached to our words and don’t like cutting something we love — even if it would benefit our content marketing. Although editing can sometimes feel heartless, it’s one of a writer’s most powerful tools. By embracing a practice of “Ruthless Editing,” you can actually become a more creative, productive, and empathetic writer. I didn’t always love editing. As a green teenage writer, brimming with adjectives and enthusiasm, I rarely edited my own work. Like many writers, I was in love with the artistry. I filled countless spiral-bound notebooks with emotional poems, essays, and journal entries. I loved writing so much that I decided it should be my livelihood. Journalism seemed like a viable career path, so I joined the school newspaper during my first semester of college. The newspaper advisor was a slight, passionate woman who I could easily imagine in her former life: behind a paper-strewn news desk, cigarette dangling from her lips, always on her way to capture the next breaking story. She was bold. She had tenure. She was my first Ruthless Editor. Unlike my grade-school writing teachers, this professor did not give one whit about word count. To her, a draft could always be shorter, tighter. Her strict adherence to AP style and the inverted pyramid forced every student to learn to cut, cut, cut. At first, I resented her and her biting red pen. She didn’t care about my work or how I stayed up late to meet her challenging deadlines. But over time, I began to realize she was working in service of a higher goal. 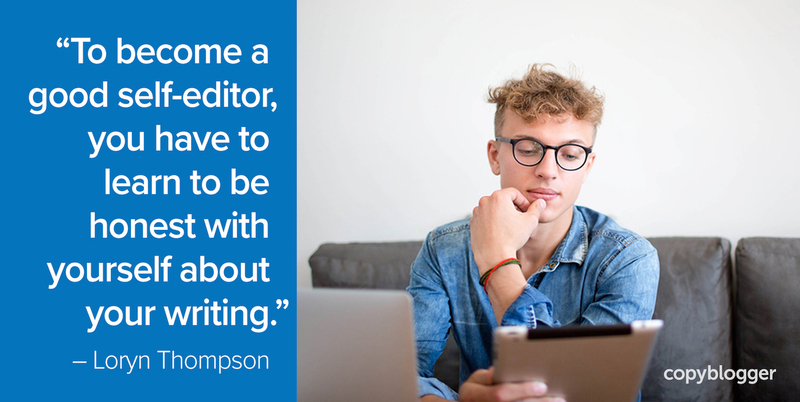 To become a good self-editor, you have to learn to be honest with yourself about your writing. And that’s a hard lesson. As a teenager, I had my own goals. When I received feedback I didn’t like, I simply brushed it aside. How could others know what was right for my writing? But with the college newspaper, there was another goal: Clear communication to our readers — to make sure students knew what was happening on their campus; anything else was incidental. Unlike when I was a “pure artist,” every sentence didn’t have intrinsic value. Some information was useful, other information was not. Period. Eventually, I learned to appreciate my professor’s hardline editing. She wasn’t (just) trying to undercut our egos. She was pouring her many years of experience into honing the next generation of journalists, whose responsibilities extended far past artistic writing. When I learned the state of modern news journalism (and realized I could never survive the always-on lifestyle), I left the News-Editorial program. But I brought my Ruthless Editing skills with me. Working on the college paper, I learned to scrutinize each word and phrase, gauge its importance to my goal, and cut or revise as needed. Even when it hurt. But it took a few years to get the most out of my new skills. Fresh off the newspaper, I grew to be too ruthless. Some days, I scrutinized myself so much I could barely get words on the page. It wasn’t until I began publishing regularly on my motorcycle blog that I learned how truly useful my solid editing skills are. Forcing myself to publish every two weeks taught me that it was okay to loosen up on the first draft and let my ideas simply flow. My strong editing skills could fix any structural failings later. Now, I’ve learned, to be a good writer you have to be both an artist and a craftsman, both a moody, brooding poet and a ruthless, cunning killer. Every piece of writing needs to have a goal. Even creative writing — and especially content marketing. There is always something to communicate: information, feelings, ideas, experiences, etc. Even if we write in first-person and use casual language with firsthand examples, our goals always need to serve others. Being a good editor is about empathizing with your readers and crafting a meaningful presentation for them. Although I know editing is about empathy, I still find it helpful to call it “Ruthless Editing.” Good editing may hurt a little, and that’s okay. We’ve all had to let go of that “perfect” phrase — the alliteration that made your heart skip a beat when you first saw it on the page, but in the end didn’t add value. Now, though, instead of simply cutting out those phrases, I’m learning to hold on to them. Just because they didn’t work for one piece of content doesn’t mean they won’t provide value in a different piece of content. Slowly, I’m learning to embrace both sides of my writer spirit, the artist and the craftsman. And, strangely, the more fully I embrace one side, the more useful the other becomes. But learn to self-edit if you want someone other than your mom to read it. And with that I’ve reached my daily limit of three fortune cookies. I’m finding so curious to share these little habits with other people. Being so new in this business, I had no idea that all writers felt this way, but I have to say, I’m loving it! I’ve seen that ‘perfect phrase’ die in front of me, but I’ve also begun to collect them lately. It’s great to see that I’m not the only one. My forever-advice for every writer I’ve ever edited. Crude but true 😉 Thanks Jack! You are right, one of the hardest lessons is to learn to be dead honest with yourself and your writing skills. I’m not a big fan of editing, but I don’t hate it. I like doing it when I need to do it. I understand it is part of the process to improve my content and also my writing skills. I feel like I learn by editing my own content. It sure is one great way to help yourself improve your writing skills. Thank you for sharing this interesting and helpful article! Yes, writing is something to take seriously. I have a primary blog that has 250 blog posts. Editing actually never ends. Spelling mistakes, content update, on-page seo updates etc. If you want traffic, you have to deal with it! I’m fairly new to writing and I don’t consider myself a wordsmith. But I love learning about it. And you’re right. The (ruthless) editing is a powerful tool. I too keep cut-offs in case I can use them elsewhere.